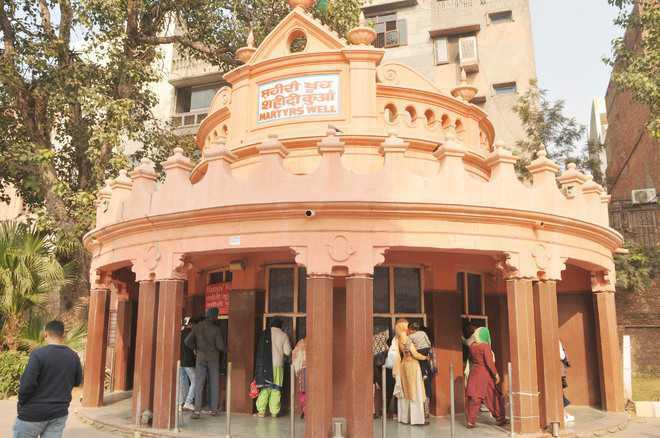 As part of its revamp plan ahead of Jallianwala Bagh massacre centenary next year, the Central government mulls sprucing up the martyrs’ well located on the premises.The grill mesh-covered well, which is testimony to the brutal killings on April 13, 1919, when hundreds of innocents had jumped into it in panic to escape the indiscriminate firing, is in a dilapidated state. As per records, 120 bodies were later recovered from the well. At present, the well is surrounded by a concrete structure having six ventilating windows on its wall which facilitate the visitors to have a glimpse deep inside the well. After the Golden Temple, the Bagh is the most sought-after spot for the visitors.Apart from preserving its heritage contour, the proposal is to fix a dome-shaped unbreakable glass or see-through fibre canopy over its outer area having approximately 20-ft diameter. Rajya Sabha MP Shwait Malik, who is also a member of the Jallianwala Bagh National Memorial Trust, said the suggestion cropped up during the recent visit of Union Minister of State (independent charge) for Culture and Tourism Dr Mahesh Sharma, who got it approved on the spot. Malik stressed that the heritage value of the well would be maintained at any cost while fixing the canopy. The job of its design has been awarded to Union Culture Ministry’s architect Vandana Raj, who is preparing the blueprint of the whole project of restoration and renovation of the Bagh. “Since the windows got worn out with its grills broken, it was observed that the existing windowpanes were not safe and inadequate to offer clear view of the inner side of the historic well to the visitors. It has been decided to fix a dome-shaped canopy, which will also ensure safety. The portion of the well, which has heritage value, will be preserved as it is, whereas only the structure that was added later on will be altered to fix the dome,” he said. Some visitors throw coins into the well. In June 2017, some unidentified persons had cut the grill to enter the well with the help of a rope and stole coins worth Rs 4,000.